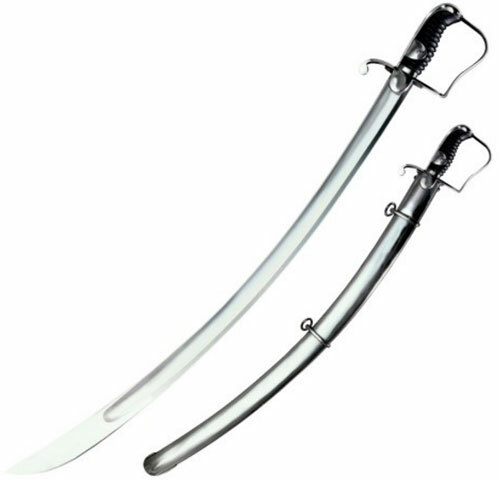 Cold Steel 1796 Light Cavalry Swords for sale are 37 ¾ inches in all. These cavalry sabers feature a 33 inch functional forged 1055 carbon steel, highly polished sharpened blade that has an ample fuller. They have a 4 ¾ inch, black leather wrapped handle with a steel hand guard and pommel. The scabbard is crafted of polished steel. They weigh 34.2 ounces and will pass the British Proof Test. These sabers are inspired by the design of a real sword that was wielded by the British military under General Blucher at the Battle of Waterloo. This design was so popular it was used by the German Cavalry until the start of the 20th century. 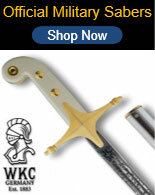 Buy the Cold Steel 1796 Light Cavalry Swords for $239.99.